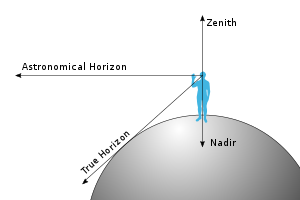 In astronomy, the nadir is a point "below" a particular location. "Below" means in the same direction of gravity at that location. The nadir is the opposite of the zenith. The nadir is not a real point. It is used as a reference for the location of other things. McIntosh, D. H. (1972). Meteorological Glossary (5th ed.). ISBN 978-0-8206-0228-8. This page was last changed on 11 June 2014, at 15:53.